The Severn Valley Railway opened in 1862, linking Shrewsbury in the North, via Bridgnorth, to Hartlebury in the South. The present day SVRSevern Valley Railway operates over the section from Bridgnorth to a point south of Bewdley station where the Stourport Branch, the original route of the Severn Valley Railway, can be seen curving away to the right towards Stourport and Hartlebury as you travel towards Kidderminster. From there, the present day SVRSevern Valley Railway continues to Kidderminster via the Loop Line opened in 1878. This page sets out a history of the Severn Valley Railway, including the Loop, from planning to closure. Article from the Bridgnorth Journal of February 2nd, 1856, encouraging the purchase of shares in the Severn Valley Railway. The first proposal for a railway using the Severn Valley was made in 1845 by the grandly named Oxford and Worcester Extension & Chester Junction Railway. The line would have been built to the GWRGreat Western Railway’s broad gauge, and would have linked Worcester to the Ironbridge Gorge via Bewdley and Bridgnorth. Despite Robert Stephenson being one of the Railway’s Engineers, the plans were rejected by Parliament and by November 1846 the company had been voluntarily wound up. In 1849 plans again emerged for a line following this route, linking the still incomplete Oxford Worcester and Wolverhampton Railway (‘OW&WOxford Worcester and Wolverhampton Railway’) at a point south of Hartlebury to the Shrewsbury & Birmingham Railway’s projected branch at Madeley in Shropshire. The proposed Severn Valley Railway would provide a more direct route between the railway junction towns of Shrewsbury and Worcester than the alternative route via Hartlebury, Kidderminster, Stourbridge, Wolverhampton and Wellington, and would also provide railway access to the coalfields of Highley and Alveley. The Severn Valley Railway Company (‘SVRC’) was formed to build the railway. The first Engineer was Robert Nicholson, an associate of Robert Stephenson, who carried out the survey of the proposed route. Although nominally an independent company, the SVRC was closely associated with the OW&WOxford Worcester and Wolverhampton Railway. The Chairman and two other directors of the SVRC were on the Board of the OW&WOxford Worcester and Wolverhampton Railway, while OW&WOxford Worcester and Wolverhampton Railway Engineer John Fowler would succeed Nicholson as Engineer of the SVRC in 1855. Originally the proposal was for a line from south of Hartlebury to Coalbrookdale, but public meetings in October 1852 confirmed the opinion that the line should continue to Shrewsbury. The first Severn Valley Railway Bill passed through Parliament and received Royal Assent in August 1853. This authorised the SVRC to raise £600,000 in shares and borrow up to £200,000 in addition. The original estimate for construction of the line was £600,000, being £110,000 for land plus £490,000 for works and it quickly became obvious that economies would be needed, including shortening the line to join the Shrewsbury & Hereford Railway south of Shrewsbury and making other deviations to the route. A second Severn Valley Railway Bill authorising share capital of £480,000 and borrowing of £160,000 received Royal Assent in July 1855. Further economies were again found to be necessary, including leaving the OW&WOxford Worcester and Wolverhampton Railway line north of Hartlebury rather than south of it, and tunneling under Bridgnorth High Town rather than crossing the River Severn via an expensive bridge. This third proposal received Royal Assent in July 1856. Continued difficulties in raising the finance meant that by 1857 an Abandonment Bill had been put before Parliament. However, following a proposal by contractors Peto, Brassey and Betts to accept part payment of £240,000 shares in SVRC for building the entire line, the Abandonment Bill was withdrawn and a final proposal put before Parliament. This included laying out the route for double track lines but only installing single track with passing places (John Fowler had fought hard to achieve this compromise; the Board had proposed laying out the entire route for single track working only). By the time the fourth and final proposal incorporating these changes received Royal Assent in July 1858, the SVRC had reached agreement with the OW&WOxford Worcester and Wolverhampton Railway that the latter would run and maintain the new line for a period of 5 years following completion. When the contractors Peto, Brassey and Betts began construction, a completion date of October 1860 was announced. However during construction a number of unstable areas of ground were discovered, while landslips also took place on completed areas of the line, the most significant north of Highley resulted in a change to the line’s route. The foundation stone for Victoria Bridge at Arley was laid on 24 November 1859 by Henry Orlando Bridgeman. During 1860, while construction of the line was still in progress, the Severn Valley Railway changed hands twice in two days. On 14 June 1860 an act of Parliament confirmed a 999 year lease of the Company to the OW&WOxford Worcester and Wolverhampton Railway who agreed to run the line. On 16 June 1860 another Act authorised a three-way amalgamation of the OW&WOxford Worcester and Wolverhampton Railway with the Newport, Abergavenny & Hereford Railway and the Worcester & Hereford Railway to form the West Midlands Railway. This company was formed on 1 July 1860. In February 1861, positioning of the four cast iron ribs of Victoria Bridge began. While work on the bridge was still in progress, the first steam working on the line took place between Stourport and Bewdley on 5 May 1861, watched by large crowds which had gathered for the occasion. Victoria Bridge was completed 5 days later. Station buildings were completed and signalling equipment installed in autumn of 1861. A first inspection of the line was carried out in December 1861 by Col. Yolland of the Board of Trade’s Railway Inspectorate. His report, dated 30 December 1861, listed a number of matters to be addressed before he could recommend opening, including installation of a turntable at Hartlebury, adjustment to the layout at Buildwas station and re-positioning of signals. A second inspection was carried out on 15 January 1862; two days later two trains ran over the still incomplete railway calling at stations to deliver apparatus for working it. On 23 January Colonel Yolland's report recommended that the Board of Trade should approve the opening of the railway. The map above is extracted from RailmapOnline.Com. The Severn Valley Railway and its links to nearby railways mentioned in the text are highlighted. Kidderminster, reached via The Loop, was 38¾ miles from Shrewsbury. The first full length working of the Severn Valley Railway was a special train of 22 carriages which left Worcester Shrub Hill at 11:30am on Friday 31 January 1862. This reached Shrewsbury at 2pm, after stopping at every station to be greeted by cheering crowds. The return journey was made with three more carriages and an additional engine. Public services began on Saturday 1 February 1862, initially with just three return workings per day. The journey from Hartlebury to Shrewsbury stopping at all stations took around 2 hours 10 minutes. Initially there were only five stations at which trains could be crossed; Stourport, Bewdley, Bridgnorth, Ironbridge and Broseley and Buildwas. A number of the other stations would be provided with passing loops at later dates. In July 1862 another act of Parliament was passed giving the Great Western Railway (‘GWRGreat Western Railway’) the right to buy the Severn Valley Railway Company before the end of 1871. However in August 1863 the GWRGreat Western Railway took over the West Midlands Railway, thus assuming the latter’s running powers over the Severn Valley Railway. The Severn Valley Railway was fully amalgamated into the GWRGreat Western Railway on 1 July 1872, by exchange of Preference Shares in the former for Consolidated Stock in the latter. From that point on, the Severn Valley Railway would be one of many of the GWRGreat Western Railway’s branch lines. Beginning in 1860, a number of schemes were proposed for a railway connecting Wolverhampton and Bridgnorth, to provide a direct route without the diversion south via Kidderminster. These included the proposal for a 'Light Railway', the Wolverhampton and Bridgnorth Light Railway, in 1897. However none of these railways were ever built. The GWRGreat Western Railway itself also proposed a similar connection in 1905, although this too was never completed. In 1878 the GWRGreat Western Railway opened ‘The Loop’ linking Bewdley to Kidderminster, over which the present day Severn Valley Railway continues. ‘The Loop’ nearly didn’t happen; construction was authorised by an Act of Parliament in 1868 which also included the nearby Stourbridge Town branch (part of which is still in use today). The GWRGreat Western Railway then sought leave to abandon ‘The Loop’ and build a line linking Bewdley to Stourbridge via Wolverley, Cookley and Kinver instead. Only when Parliament rejected this proposal did ‘The Loop’ go ahead. A more detailed history of the Loop's construction is given here. 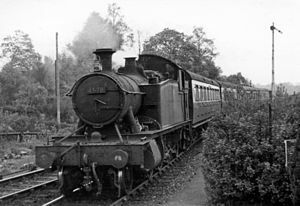 Most Kidderminster to Bewdley trains left the Severn Valley Railway at the Tenbury Branch and took the Wyre Forest Line (dismantled in the 1960s and now a popular walking route) to Tenbury Wells and Woofferton. This traffic effectively crossed the Severn Valley Railway, rather than following it for any distance. The opening of the loop line in 1878 saw the introduction of the first signal boxes on the line at Bewdley. Installation of other signal boxes on the line continued through the 1880s, in conjunction with the installation of additional passing loops at Arley, Hampton Loade, Coalport, Cressage and Berrington. The Severn Valley line was used for both passenger and freight traffic. However it remained single track throughout its life, and as a consequence rarely saw significant use as a through connecting route apart from brief spells during the two World Wars when it was used to bypass the congested lines of the West Midlands. Indeed it is likely that most passengers only traveled on part of the line during their journey. The line was rarely at the forefront of railway technology, although 1905 saw the use of brand new steam railcars between Bewdley, Kidderminster and Stourport. A year earlier the GWRGreat Western Railway also introduced a motor omnibus service between Bridgnorth and Wolverhampton. The peak period of use of the line was between 1880 and 1920. After that time passenger and freight traffic began to decline, although this was mitigated within the section used by the present day SVRSevern Valley Railway by the opening of the West Midlands Sugar Co (later British Sugar Corporation) factory at Foley Park, Kidderminster in 1925 and Alveley Colliery at Highley beginning coal delivery by rail in 1939. A number of halts such as Northwood Halt, Jackfield Halt and Cound Halt were introduced in the 1930s in a bid to attract more local custom. During the Second World War the line saw an increase in traffic, with service personnel travelling to military bases in the area and additional wartime freight. The line served as an alternative diversionary route, and a variety of non-GWRGreat Western Railway locomotives saw service. The Ministry of Food opened an emergency food storage depot near Stourport in 1941, with a rail siding accessed by the Brindley Street Ground Frame. Kidderminster and Stourport saw many ambulance trains, the US Army having a hospital at Stourport. The railway also served the US camp at Burlish Top and RAF Bridgnorth situated at nearby Stanmore. Ownership of the Severn Valley Line passed to British Railways (BRBritish Rail or British Railways) upon nationalisation in 1948, when it became part of the British Railways Western Region “BRBritish Rail or British Railways(W)". The 1950s saw steam replaced on some services by GWR Diesel Railcars and BRBritish Rail or British Railways Diesel Multiple Units (DMU). 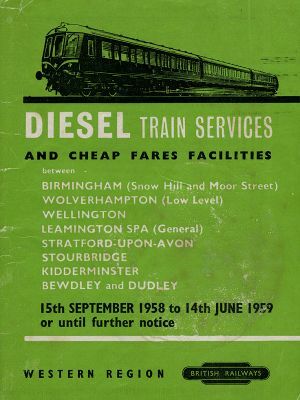 On 1 January 1963, control of the Severn Valley Branch passed from BRBritish Rail or British Railways's Western Region to their London Midland Region. The latter Region appears on the August 1963 closure notice below. After the War, traffic numbers continued to decline and the BRBritish Rail or British Railways began a programme of closures. Many of these pre-dated the British Transport Commission ('BTC') report "The Reshaping of British Railways" ('The Beeching Report' as it came to be known), which was published on 27 March 1963. On the lines connecting with the Severn Valley branch, passenger services between Woofferton and Tenbury Wells were withdrawn on 31 July 1961. The following year, passenger services between Much Wenlock and Wellington via Buildwas ended on 23 July 1962, while services between Tenbury Wells and Bewdley were withdrawn on 1 August 1962. On the Severn Valley Branch itself, preparations for closure began in autumn 1961. BTC officials carried out traffic surveys of passenger numbers between 16-22 October 1961, following which BRBritish Rail or British Railways(W) announced in January 1962 that the Severn Valley Branch was under review, that passenger services were 'suspected of being unremunerative' and that economies were being investigated. This threat of closure was discussed by Bridgnorth Council in February 1962. BRBritish Rail or British Railways(W) announced in June 1962 that passenger services would be completely withdrawn between Shrewsbury and Bewdley (and also reduced south of Bewdley). Statistics gathered in September 1962 by officials working on the Beeching Report would undoubtedly have reinforced BRBritish Rail or British Railways's argument for the ending of passenger services. Under the 1962 Transport Act, the Transport Users Consultative Committee ('TUCCTransport Users Consultative Committee') could only consider the hardship suffered by passengers if their services were terminated. Following consultation with Bridgnorth Council and others at a public meeting on 8 November 1962, the TUCCTransport Users Consultative Committee announced on 20 November that it had submitted a report to the Minister of Transport confirming that closure would cause hardship to users in Bridgnorth and Highley and definite hardship to those in the Linley, Hampton Loade and Northwood areas. On 24 November, just four days later, the go-ahead for the construction of Ironbridge B power station on the site of Buildwas station was announced, even though the closure of the Severn Valley Branch was not formally confirmed. While the TUCCTransport Users Consultative Committee's appeal was still being considered, the Beeching Report was published on 27 March 1963, including the Severn Valley Branch whose closure was already in progress. The BTC saw no grounds to agree to the TUCCTransport Users Consultative Committee's appeal, and on 2 August 1963 the Transport Minister Ernest Marples approved the closure for passenger services with effect from 9 September. Thus the closure of the line was ultimately the responsibility of BRBritish Rail or British Railways rather than a direct result of the 'Beeching Axe'. 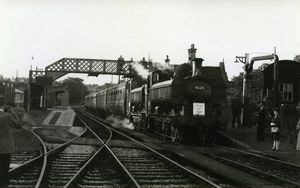 When the end of passenger services north of Bewdley was formally announced following the Minister's decision, assurances were given that freight services would continue throughout the line. However even before the passenger services had ended, plans for the new Ironbridge power station were published by the CEGB showing cooling towers on the track bed at Buildwas. On Sunday 8 September the final 6.58pm Bridgnorth to Birmingham Snow Hill train, normally a diesel railcar service, was hauled by ex-GWRGreat Western Railway pannier tanks 9624 and 4665 carrying a ‘Special Last Train’ headboard. It was followed by the last passenger service north of Bewdley, the 8.30pm Hampton Loade to Snow Hill formed of a three car diesel set. Passenger services between Shrewsbury and Bewdley ceased on 9 September 1963 as announced. Four days later on 13 September, BRBritish Rail or British Railways posted advance notices of their proposal to end through freight services. Appeals against the proposal proved fruitless, and the last through freight train ran on 30 November 1963. North of Buildwas Junction, the line from Sutton Bridge Junction was kept open for the movement of boilers and other equipment to the new power station. This took place on Saturday 22 April 1966, after which the section to Berrington was closed and the track lifted. The section north of Berrington continued in use for the testing of Rolls Royce Sentinel diesel shunting engines until January 1968. From that time only a short spur of the old line remained open to serve the Shrewsbury Abbey sidings oil depot until that closed to rail traffic on 18 July 1988. South of Alveley Colliery, the line southwards through Bewdley remained in use for moving coal to Stourport Power Station until the Colliery closed in 1969. The line between Buildwas and Alveley Colliery Sidings was abandoned by BRBritish Rail or British Railways. In 1964 they began to lift the track from Buildwas southwards for re-use in the enlargement of Bescot yard near Walsall. Fortunately sufficient material had been reclaimed by the time the north end of Bridgnorth Station was reached, so the workforce was redeployed to work on the Stourbridge Junction to Smethwick line. 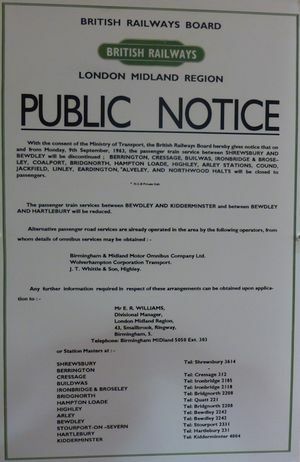 BRBritish Rail or British Railways ceased passenger services from Bewdley to Hartlebury on 6 January 1970, ending their use of the original Severn Valley Line. Services from Bewdley to Kidderminster over 'The Loop' ended at the same time, although British Sugar Corporation freight traffic between Foley Park and Kidderminster continued until 1982. When the SVRSevern Valley Railway opened services to Bewdley in 1974, they had also acquired the line as far as Foley Park. In the late 1970s and early 1980s the SVRSevern Valley Railway, with BRBritish Rail or British Railways’s co-operation, were able to stage outgoing main line rail tours (and play host to incoming ones) via the remaining BRBritish Rail or British Railways section of 'The Loop' between Foley Park and Kidderminster. On some weekends in summer, BRBritish Rail or British Railways also operated a few DMUDiesel Multiple Unit special services from their Kidderminster station to the SVRSevern Valley Railway at Bewdley. In the early days the West Midlands Railway used a number of locomotives inherited from the three constituent companies. 2-4-0 locomotives were generally used for passenger traffic up to World War 1, supplemented by 0-4-2s and 0-6-0s used on goods trains. Steam railmotors were also introduced in 1905. The early 1920s saw the introduction of auto coaches (also known as auto cars or auto trailers), while the end of the 1920s saw new 45xx class small prairies on the line. These 2-6-2 tanks became the main source of motive power until the 1950s for both passenger and freight workings, supplemented by 0-6-0 pannier tanks, although during World War 2 51xx class large prairies, ex Cambrian Railways 0-6-0s and even LNERLondon & North Eastern Railway J25 0-6-0s found their way to the Severn Valley Railway for freight services, while some passenger services were hauled by ageing GWRGreat Western Railway ‘Duke’ and ‘Bulldog’ 4-4-0s. GWRGreat Western Railway Diesel Railcars such as Railcar 22 were introduced in 1936 on passenger services between Kidderminster, Hartlebury and Stourport, and after World War 2 they were occasionally on services travelling the whole length of the line. After nationalisation, the line at first continued to use predominantly ex-GWRGreat Western Railway locomotives. However the 1960s saw an increase in ex-LMSLondon Midland & Scottish Railway and BRBritish Rail or British Railways Standard locomotives, and the replacement of ex-GWRGreat Western Railway railcars by BRBritish Rail or British Railways railcar single and multiple units. These locomotives saw out the remaining years of the line until closure as a through route in 1963, although fittingly the last BRBritish Rail or British Railways passenger train into Bridgnorth from the south on 8 September 1963 was hauled by ex-GWRGreat Western Railway pannier tanks numbers 9624 and 4665. This gallery illustrates some of the variety that could be seen on the line in the BRBritish Rail or British Railways era. At opening in 1862, four trains per day ran between Shrewsbury and Worcester over the Severn Valley Line, with just one train per day on Sundays. Most stopped at all stations and none were particularly fast. Following the opening of the Kidderminster Loop in 1878, some Shrewsbury departures would divert to Kidderminster instead of Worcester. Around the same time, other Shrewsbury departures began to terminate at Hartlebury or Bewdley, to connect to local services. By 1900 there were five departures on weekdays from Shrewsbury, two to Worcester, two to Hartlebury and one to Kidderminster. There was also one service to Bridgnorth. In the early 1930s, the Sunday timetable included one Bridgnorth to Shrewsbury service and one service nicknamed the “Fisherman’s Special”. The latter left Birmingham Snow Hill at 7.22am, arriving at Shrewsbury via Kidderminster at 10.30am, with the return departing at 8.00pm, arriving at Snow Hill at 10.47pm. By 1938 there were still five trains per day to and from Shrewsbury. However shortly after World War 2 the service was reduced back to four trains per day with the Sunday service ceased. The weekday service remained more or less unchanged until closure, although Sunday services were re-introduced. Through passenger services from Kidderminster via the Loop were mainly towards the Tenbury Branch. In addition to the one departure to Shrewsbury referred to above, the October 1940 timetable showed four departures for all stations to Woofferton; by June 1947 this had increased to five. With just four or five through trains per day, much of the passenger traffic on the line was for local services. At the south end, the local service was sometimes nicknamed ‘The Bewdley Banjo’. This was mainly provided by an auto-coach until the early 1940s, and thereafter by a diesel railcar. The service would operate throughout the day around the triangle formed by Kidderminster, Bewdley and Hartlebury, occasionally going to Highley (providing a service for miners working there) and as far as Bridgnorth. By their nature, most goods services were operated as required. However one scheduled goods service per day would normally work from Shrewsbury to Kidderminster. Pre-World War II this was usually operated by a GWRGreat Western Railway ‘Dean Goods’, superseded post-War by its natural replacement, the Collett 2251 0-6-0 goods (during the War an LNERLondon & North Eastern Railway J25 0-6-0 was often used). Another daily goods service also worked from Kidderminster over the Tenbury Branch. Other goods traffic involved sugar beet trains from Kidderminster to Foley Park. The processing season ran from mid-September to mid-January, during which time up to four complete trains per day would arrive at Kidderminster. Shunting of these loads from Kidderminster yard to the Foley Park factory required a shunting engine to be available 24 hours per day. Coal trains from Alveley required use of a tender engine. Post-War these were usually operated by a GWRGreat Western Railway 4300 class 2-6-0. This section provides links to individual pages showing detailed timetables in use during GWRGreat Western Railway / BRBritish Rail or British Railways ownership. Traffic statistics published by the GWRGreat Western Railway for stations on the Severn Valley Railway in selected years between 1903 and 1938 are set out below. Hartlebury and Shrewsbury are not shown, as their reported totals would include only a small portion of traffic relating to the Severn Valley Branch. Buildwas is included for completeness, although a portion of traffic originating there would relate to the Wellington and Much Wenlock branches. In the early days of railways, working arrangements were primitive and accidents commonplace, though thankfully often minor. LTC Rolt in his book 'Red For Danger' refers to the Board of Trade's struggle to make railway companies implement the fundamental principles of 'Lock, Block and Brake', the interlocking of signals and points, absolute block working, and the fitting of continuous brakes. On 8 November 1866, a goods train from Buildwas ran through signals approaching Bewdley and collided with a standing goods train. The driver was fined for running too fast and the guard for failing to apply brakes when signalled to do so, the latter being cited as the main cause of the accident. Most locomotives of that time had either hand brakes on the tender only, or in the case of some tank engines, no brakes at all, train braking being primarily the responsibility of the guard acting on signals from the driver. Continuous brakes began to be introduced in the mid 1870s..
On 20 June 1867, GWRGreat Western Railway 2-4-0 No 189 (ex OW&WOxford Worcester and Wolverhampton Railway) left the rails while departing Bridgnorth Station south-bound. The accident was attributed to the locomotive not having been properly balanced when leaving Worcester Works. On 7 May 1870 a collision occurred at Bridgnorth when a porter set points incorrectly. The points were not interlocked with the signals. On 26 November 1888 the 6.30pm Stourbridge Goods from Tenbury ran into a passenger train from Shrewsbury at the north end of Bewdley Station. The passenger train had passed the home signal at danger and moved into the path of the goods. On 29 November 1898 a passenger train from Hartlebury was derailed at Arley after running through down home signal at danger just as the signalman was changing the points for the loop. The circumstances of the accident suggest that locking bars had not been installed at the time to prevent points being changed under a train. On 13 January 1928, 4575 class small prairie No 5508 was derailed north of Bridgnorth Tunnel while traveling at 45-50mph when rotten sleepers gave way. Nobody was injured in the accident. In March 1956, GWR Diesel Railcar W10W caught fire and was was burnt out at Bridgnorth. In August 1964 another car was struck by an empty goods train on the same crossing, also resulting in fatalities to two of the passengers. The Severn Valley Railway Souvenir Guide, available from Gift Shops on the SVRSevern Valley Railway. Past editions of Severn Valley News. ↑ Marshall (1989) pp. 48-49. ↑ 3.03.1 Vanns (2017) p. 43. ↑ Smith (1968) p. 25. ↑ 6.06.1 Beddoes & Smith (1995) p. 190. ↑ Marshall (1989) p. 162. ↑ Magner (1997) pp. 24-25. ↑ Vanns (1998/2013) p. 93. ↑ Magner (1997) pp. 26-28. ↑ 11.011.111.211.311.4 Magner (1997) pp. 32-35. ↑ Marshall (1989) p. 165. ↑ Nabarro (1971) pp. 54-56. 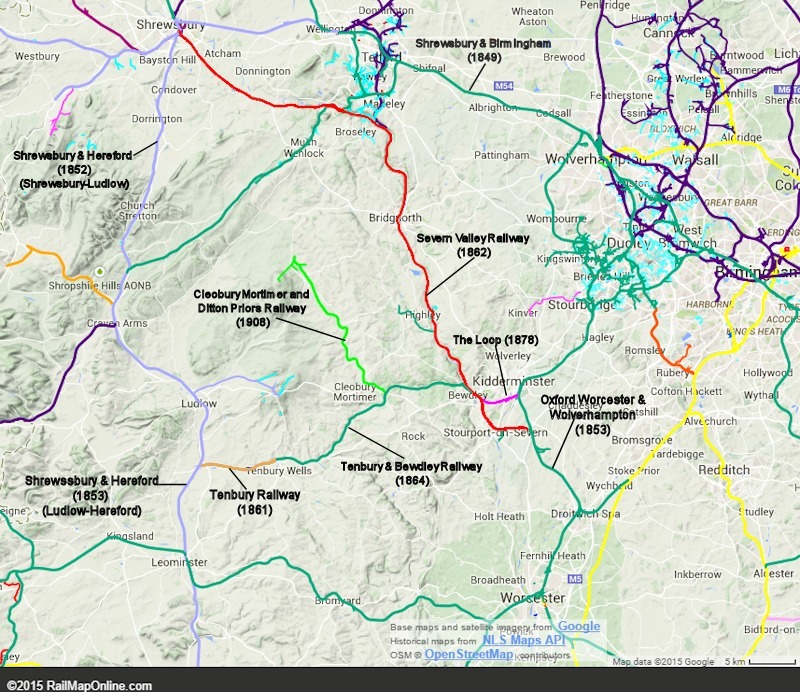 Rail Map Online Map of railway lines around Bewdley, showing 'The Loop' (highlighted), the original Severn Valley line continuing to Hartlebury, and the Wyre Forest Line to Tenbury. This page was last modified on 3 December 2018, at 17:17.